Here in the Cinque Terre we have a *big* thorn in our side: pickpockets that ride the trains and circulate amongst passengers at the railway stations. As toursim in our area has dramatically increased in recent years, so have the thieves that have come to prey on said tourists. It’s incredibly frustrating and infuriating (not only for visitors but also for locals). And for the pickpockets it has become quite a lucrative business. 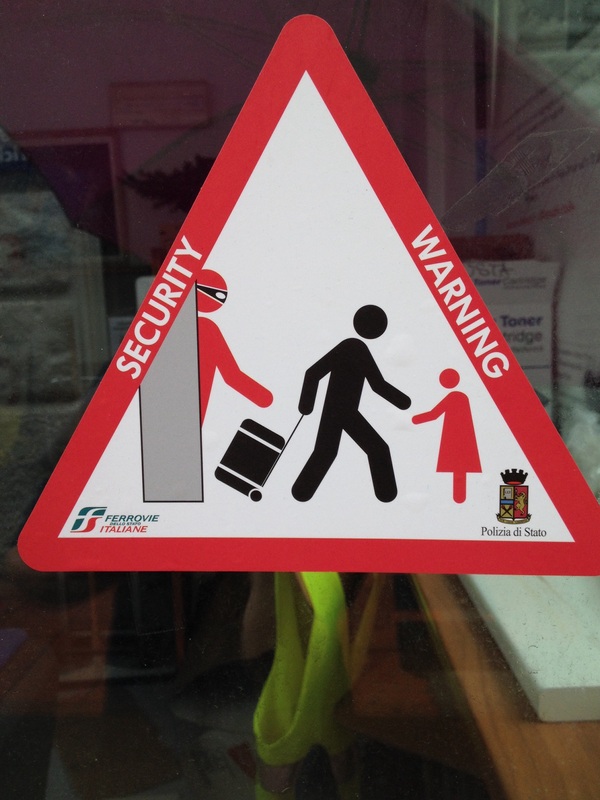 You will find warning signs posted and voice recordings playing throughout the train stations in the Cinque Terre, La Spezia and Levanto, cautioning visitors of the danger of pickpockets and thieves. Local law enforcement agencies have tried to increase their presence in the stations and on the trains but they are outnumbered (and oftentimes outsmarted) by the young thieves. 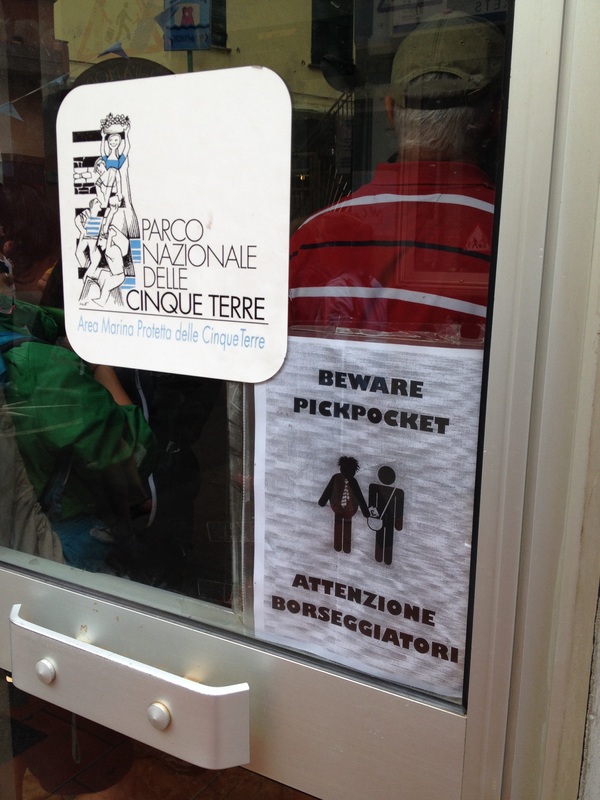 Most of these pickpockets are young females from nomad camps in Genoa, some even sport baby bumps (*gasp*). These thieves (or should I say those that send them?) are astute and they know their way around Italian law (which, due to a loophole, is basically “catch & release” with Roma minors and pregnant women). On a positive note, these pickpockets know not to enter the villages themselves as they are quickly spotted by locals (who have an eye for recognizing them despite their attempts to blend in by dressing like tourists), so the villages themselves are still very safe. Do not leave your luggage or personal items unattended. Ever. It takes just a matter of seconds for those items to disappear. Be especially vigilant in crowded areas and when there’s a rush to get on or off the train. This is the easiest moment for pickpockets to snag wallets or other valuables as you are distracted (and so is everyone else, too). The thieves usually work in teams and while one is pushing the crowd towards the door the other is using quick hands to lighten pockets and purses. Keep an eye out for faces in the crowd that are watching people’s personal belongings more than people’s faces. If you notice bag watching taking place take it as a sign and be on high alert. Don’t forget that these thieves usually work in teams so you might see them making eye contact with a second (or third) person. Be cautious when using the overhead racks on the trains or when storing a bag under your seat. You can’t imagine how easy it is for these trained thieves to simply pull a bag out from underneath you (without you even noticing!). And I can’t begin to tell you how many times people get up to exit the train only to remember that they left something on the overhead rack. By the time they go back for it, it’s gone. Do not keep all of your valuables (cash, credit cards, passports, etc.) in one spot. The old adage, “Don’t put all of your eggs in one basket” definitely applies here. Spread your valuables out in multiple places, leaving just one credit card and limited cash handy in your purse or wallet. Once you get to your accommodations, leave valuables there rather than toting around everything with you (just bring the bare necessities when you’re out & about). If you do place your luggage on the overhead rack or beneath your seat on the train, try to wrap or clip the strap in such a way that your bag can’t be easily removed. When I put something beneath my seat on the train I usually will have a strap wrapped around my ankle. I am also well aware when someone sits behind me (in the back-to-back seats) and I’ll make a point of moving my belongings and making eye contact with them if they seem suspicious. I know you might cringe at the thought, but money belts really can be a lifesaver. As mentioned previously, keep only the essentials in your purse or wallet while traveling (one credit card and enough cash to get you through your day). Everything else (like your passport, remaining credit cards and cash) should be either tucked safely in your money belt or deep within a larger piece of luggage. Don’t put anything you’ll need to use frequently in your money belt (because there’s nothing worse than having to partially undress in public each time you need to get something out). In my opinion, your money belt really is the safest place for your passport. There are lots of options for money belts out there, but this one that goes around your neck or this one that goes around your waist are both available on Amazon and have fab reviews. For the love of all things holy, do not wear your money belt outside of your clothing (this totally defeats its purpose). Have photocopies of everything (the main page of your passport, front and back of your credit cards, etc.). This will be really handy in the unlucky event that your belongings are stolen. Of course, that means you should store these photocopies in a different place from the originals. It’s also a good idea to leave a copy of these things at home with someone else, too (just in case). Buy travel insurance. Make sure that it includes theft and be sure to read the fine print so you know what’s included (and what’s not). If you have travel insurance and you’ve been pickpocketed you will need to file a police report for your claim. Keep in mind that this problem is persistent throughout Italy in any of the touristic hot spots (like Rome, Florence, Venice, Milan, etc. ), not just the Cinque Terre. Spare yourself the heartache and headache by always being vigilant. *This post includes affiliate links. If you make any Amazon purchases by clicking through the product links above you’ll help support the hosting and upkeep of the blog… at no cost to you! Grazie mille! I am visiting in the beginning of August and a solo traveller. I really want to swim but I am afraid of leaving my bag on the beach. I have bought a water proof pouch for my money and phone so I can take it with me in the water. Will my bag with clothes still be okay on the beach? Any tips for a solo traveller in Cinque Terre? It’s a good idea not to bring valuables with you to the beach. I leave my wallet at home and just take bare necessities with me (which usually means some cash, my cell phone and a towel). Actually, the chances of being pick pocketed are much higher on the trains versus the beach (but of course, better safe than sorry). I always feel like my belongings are more secure when we go to a “private” portion of the beach (versus public), too. You’ll recognize these places by the colorful umbrellas and entry fees. The lifeguards in these stabilimenti balneare not only watch swimmers but also keep an eye on the comings and goings of people on their portion of the beach. I was in Cinque Terre in July 2016. I got on a train in Monterosso. The journey took only 5 minutes to our stop so we decided to stand near the exit, which turned out to be a terrible mistake. I want to write my experience here so travelers can be warned: we were approached by a group of girls aged between 13-15, they came to the end of the train wagon and showed everyone that it was too hot to be inside and they wanted some fresh air. One of them was wearing a grey shoulder bag on the chest and her hand was hiding underneath her bag. She came very close to me. The group of girls started yelling and created chaos: trying to open the door and making lots of noises. When we were looking at the door, the girl with shoulder bag started to open my bag. I felt movement in my bag and I stepped back. I couldn’t see her hand but her bag was touching mine. Luckily my bag has a zipper inside, nothing was stolen. Before we left Cinque Terre, again I was approached by the same group of girls. This time we were getting on the train and two rushed in, and standing in the middle of hallway. I saw the same shoulder bag and this time, both my hands were carrying luggages. The girl walked towards me and this time I yelled very loud. She and her gang left the train immediately. 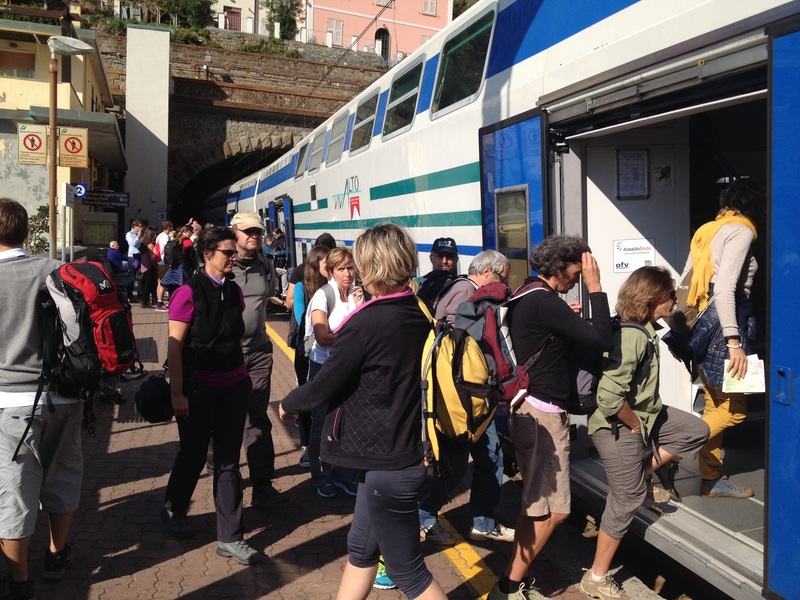 During our 5-day stay in Cinque Terre, we have seen tourists screaming ‘thieves’ and running after departed trains a few times. It seems that this region has been occupied by thieves, especially in the train station. My friend also saw a pregnant woman, who looked normal but she was also a pickpocket. You are absolutely right, during peak hours our trains (and stations, to a lesser degree) have been invaded by these thieves. It’s absolutely maddening for locals and visitors alike. Last year I was on the train and I saw a group of pickpockets come through and zone in on a couple with luggage standing near the door. I got up with my young son in tow and charged to the door and starting yelling to anyone within earshot that the group of young girls were thieves. Most of the tourists on the train looked at me like I was out of my head, but the girls immediately got off the train and loaded onto the next car. The problem, from a legal standpoint, is that the thieves are usually minors or pregnant women from nomad camps located elsewhere in Italy. Because of loopholes in Italian law and their status they can’t be prosecuted. I’m thankful that your vigilance protected you from a potential theft.